New Focus ST revealed | What Car? 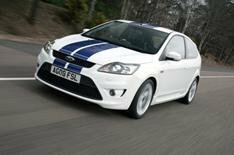 Ford's refreshed Focus ST will cost from 18,250. The car has the revised styling of the rest of the Focus range, which involves new body panels on the entire car except the roof. It is powered by the same 221bhp 2.5-litre turbocharged engine, which takes the car from 0-62mph in 6.8sec and on to a limited top speed of 150mph. The suspension has been tweaked to improve ride and handling, while stability control and traction control are now available as standard. The car is available in three- and five-door versions and three trims: ST, ST-2 and ST-3. Standard equipment includes 18-inch alloy wheels, sports seats, a sports steering wheel, a keyless starter button and a capless refuelling system. ST-2 adds an uprated audio system, bi-xenon lights, LED rear lights and a heated windscreen. ST-3 models have an in-dash six-CD player and full leather trim. Options include a tyre deflation warning system, Bluetooth phone connectivity and sat-nav.